Like any radio communication device, the humble radio scanner is only as good as the signals it receives from the many various transmission sources that abound in most countries. The key to getting the best reception is to enhance the signal capturing antenna for most gain and the transmission line so that there is the least loss on the ?signals from the ariel to the scanner. As most radio scanners come with some sort of basic coax & antenna that tries to do an adequate job of this but does not, it should be the first thing to be improved on in any way possible. New Antenna and New Coaxial cable from the scanner to the Ariel. New low loss coax, usually 75 ohms with quality BNC connectors at the least if you must use RG 58 or similar high quality shielded TV coax, N Type if possible on larger diameter 50 Ohm coax. For example RG213, LDF 450 etc. which has much lower loss over distance at higher VHF & UHF frequencies. As most buy a radio scanner for listening the public utilities, these are usually at VHF or higher. New antenna that is selected for most gain in the main area of frequency coverage you listen to mostly. Antenna Options: Countless! If you want the widest frequency coverage a Discone with a TV masthead preamplifier is worth considering. I personally use a few different types in different locations because I have scanners in the Garage and in the Office of my Home. Radio Scanner reception across wide bandwidth with Vertical polarisation for Ham Bands, Marine, Aircraft, Utilities, Emergency and more. Vertical Mobile ZCG multi-band fibreglass wire-wound whip comprising three coil sections about 4′ long covering from 25 – 500 MHz with some slight gain on higher frequencies. This antenna feeds into a large 5 port TV High Gain Amplifier then the stronger signals are sent to two realistic radio scanners and a Marine VHF radio I use as a dedicated scanner receiver. This system seems to work extremely well with many distant stations able to be received at full quieting. I do have to admit that this system uses RG58 50 Ohm Coax in a 3 meter length. TV and Radio Scanner reception = Horizontal & Vertical Polarization needed. Amplified Caravan TV “UFO” antenna with?Horizontal Polarisation?with modifications to enhance VHF Vertical reception as well. As I am trying to get into Queensland and Western Australia from Geelong on ACARS I have modified it by adding another Ariel base at the top and fitting a vertical stainless steel whip of a quarter wave at 130 MHz. The “UFO” shaped plastic box has the amplifier built in attached to SIX Horizontaly polarised UHF four element yagis made from aluminium strips arranged in a circle to cover all points of the compass. On top of this box in the weather is two horizontaly polarised folded dipoles at right angles to each other. The construction is quite good but could be improved upon and has had to be by me recently after heavy weather. 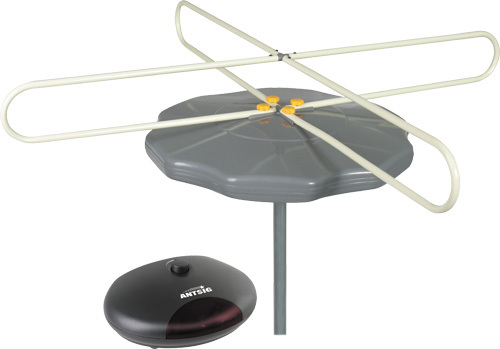 This antenna works extremely well on TV and VHF & UHF radio scanning in its base form even though it is optimised for horizontal polarisation. It has good quality coax and a powered masthead amplifier built in with gain controlled from the indoors base module that has two 75 Ohm TV outlets and 240VAC/12vDC input. One TV outlet goes to my Toshiba TV Monitor ($5 at Op-Shop) beside my computer monitor for watching car races etc. The other outlet is sent via splitter to three Uniden radio scanners as the signal is so good from the antenna, and another to my Winradio PCB in a small desktop computer. The Win-Radio WM1000 SDR scanner is usually running on 131.550 MHz on AM no Squelch feeding back into the Audio PCB to drive the WACARS 7.0 ACARS Aircraft Flight Monitoring software on the host computer. So far I have managed to log aircraft just inside the far borders of South Australia & New South Wales and really want to see them in WA & QLD! Awsome Omnidirectional Radio Scanner Antenna – MORE HERE. 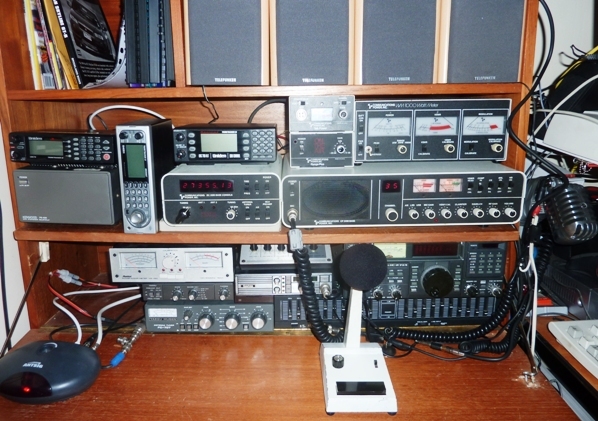 This entry was posted in CB-Radio-Hobby, Radio-Scanners by turbox. Bookmark the permalink. Saved as a favourite, cool internet site!